Call 800-459-8521 or write (using the form on the page) to inquire about other items. Gundrill Stick Blanks 12 1/4"
Thank you for your inquiry. An H.B. 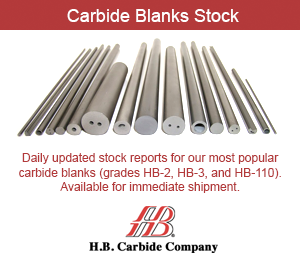 Carbide sales team member will be in touch shortly. For urgent matters, you can contact us directly by phone at 989-786-4223.